I’ve been blogging longer than I’ve been on Facebook. I’m sort of proud of that. Why? Because being a blogger makes me a better mom, and I can’t say that about being on Facebook. It’s my creative outlet. Some moms knit or paint. Others like to cook or exercise. I blog. It gets the creative juices going and makes me a happier person and mom. I have archived little moments in our family life. That funny thing my daughter said years ago? I captured it. That time my kids and I shared a spontaneous hug? Wrote all about it. New friends. I have befriended many bloggers. We read each other’s blogs, share our struggles, and laugh at the same stuff. It shows my kids a different dimension to friendship, because most of these bloggers I’ve never met in real life and that doesn’t matter. Support. So many times I have been struggling with a parenting question or issue and another blogger shares much-needed advice or a perspective that helps. Blogging reminds me I have limited control, just like motherhood. I cannot predict when a post will resonate with people and go viral just like I cannot predict when my tween will listen to me. I have been rejected and keep trying. Honestly, some posts are read by mere handfuls of people. Or I submit essays to outside publications that are rejected or just ignored. Eh. It’s part of life and I’m showing that to my kids. Meanwhile I just keep writing. It has made me leave my comfort zone. I had no interest in using Pinterest until I learned that it refers most traffic to blogs. But I like words, not pictures, I thought. Still, I took a class, started digging out royalty-free shots, learned PicMonkey, and uploaded my pins with keyword rich descriptions. It DOES send me 75% of my blog traffic. The lesson for my kids is just do it. Social media savvy. So you now how I feel about Pinterest. I hesitated to join Instagram, too. Heck, I still remember my embarrassment when I started my blog’s Facebook page and I had less than 100 likes. But now I feel knowledgeable about what’s going on out there in social media land. My familiarity with this stuff makes me better prepared as my teen and tween enter the world of smartphones. Or so I’d like to think! Being a blogger makes me a better mom because I’m conscious of my online presence and what I share about my kids. See 1-9. 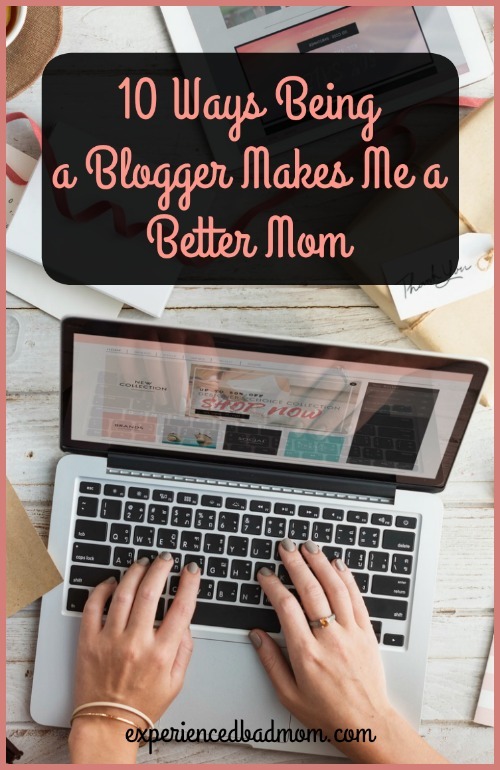 That’s because I already made the blog graphic for Pinterest and I’m not going back and changing it to “9 Ways Being a Blogger Makes Me A Better Mom”! Does your hobby or passion pursuit make you a better mom? If you are a blogger, do you agree that it makes you a better mom? Thanks for sharing. I think that’s why I wanted to share my experience — if you just see most posts from successful bloggers or blogging companies, they are all about monetizing or increasing page views. That’s great, but it took me a while to realize my niche and my blog don’t fit perfectly into doing either of those things. So it came back around to why am I blogging and it’s really about the writing and interacting for me. I like it, it’s my hobby and it makes me happy. And that’s enough. I love this! It’s very true – blogging teaches you a lot and it shows your kids that there are tons of ways to achieve results, and to never stop learning, all that stuff. I’m still struggling on Pinterest as well – what course did you take? (And was it free?) I was also hesitant about Instagram, but I love taking pictures so that wasn’t as tough for me. Keep up the good work mama! I’m glad you can relate! I took Pinning Perfect by Blog Clarity a few years ago. At the time, I think it was $65 which was a lot for me. Now, alas, I think it’s double that. Good luck! I like that word, therapeutic. Yes it is! Fab post. Love love love it! PS: My goal this month is to get on the Pinterest bandwagon too… I’m just about mastering picmonkey/ canva and the like. So, yes to all of these. Though #10 is probably my favorite. I know my husband wishes I didn’t have the blog, but I nearly have a panic attack whenever he tries to insinuate that I should ‘slow down’. Blogging isn’t for the faint of heart, but if you love it, it’s so wonderful! Yes! It makes me happy to re-read old posts and laugh at my kids’ antics when they were younger that I’ve already forgotten about. Yup. We parents need that little something just for ourselves!